With the full spoilers of Modern Masters 2015 unveiled last Friday, it seems criminal for an mtgfinance writer not to write about Modern Masters. Believe it or not, there is something else I am more excited about this week. Plus, my fellow MTGPrice writers wrote about Modern Masters extensively over the past few days. Jared Yost (@gildedgoblin) talked about the ups and downs of Modern Masters 2015, Travis Allen (@wizardbumpin) discussed the financial implications of the cards present in the set and listed a few cards to pick-up, Derek Madlem (@GoingMadlem) wrote about the potential impact of the set on individual reprints and yesterday Corbin Hosler (@chosler88) has some interesting things to say about adopting a next level approach to pinpointing which Modern staple could be the next Inkmoth Nexus. I am excited because Dragons of Tarkir redemption has finally begun. After last Wednesday’s Magic Online downtime, players could finally purchase redemption orders for Dragons of Tarkir sets. I have only hopped on the redemption bandwagon a few months back. The first set I ever redeemed was redeemed a Khans of Tarkir foil set to get my hands on foil fetchlands and shiny UR Delver components like Monastery Swiftspear and Treasure Cruise (this was prior to Treasure Cruise sinking under the weight of the banhammer in February). In March, I redeemed a foil set of Fate Reforged to get my copy of foil Ugin, the Spirit Dragon (whose price was adamantly high) and a plethora of EDH and Tiny Leaders generals and goodies. And this Wednesday, I’ve placed a redemption order for a foil Dragons of Tarkir set to get my foil Dragonlords. After waiting for more than a month – a new set can only be redeemed a month after the set’s release on Magic Online – foil Dragonlords and a host of other DTK dragons would be flying to me in about ten days (on a FedEx plane of course). Since I discovered the resoundingly large difference between digital and paper foil set prices, I’ve been using redemption to get my hands on eternal and EDH foils rather than hunting them down individually. It is a time-efficient method compared to procuring individual foils in trade or trying to snipe eBay auctions. But how much extra value do you gain from redeeming foil sets to get your expensive foils as opposed to trading for them or buying them straight from vendors? After all, when you redeem a foil set, you are paying for the other 200 or so cards in the set that is chaff (but shiny chaff). In January, I advocated using redemption to get foil fetchlands on the cheap. Is that opportunity a one-off disparity between the intangible Magic Online foil market and the paper market? Or do we actually make a profit in foil redemption for the majority of sets? Today’s article is going to crunch the numbers from the sets in the Khans of Tarkir block to answer those questions and give an idea of the value to be made, or lack of, from redeeming foil sets. This article will only cover foil redemption as the margin for redeeming non-foil sets are much smaller, especially after the handling price for redemption increased from $5 to $25 per set. The total price of the set in paper and total buylist price were calculated using MTGPrice’s browse set tool. The price of the set in paper is the total price of each foil in the set based on their fair trade price. 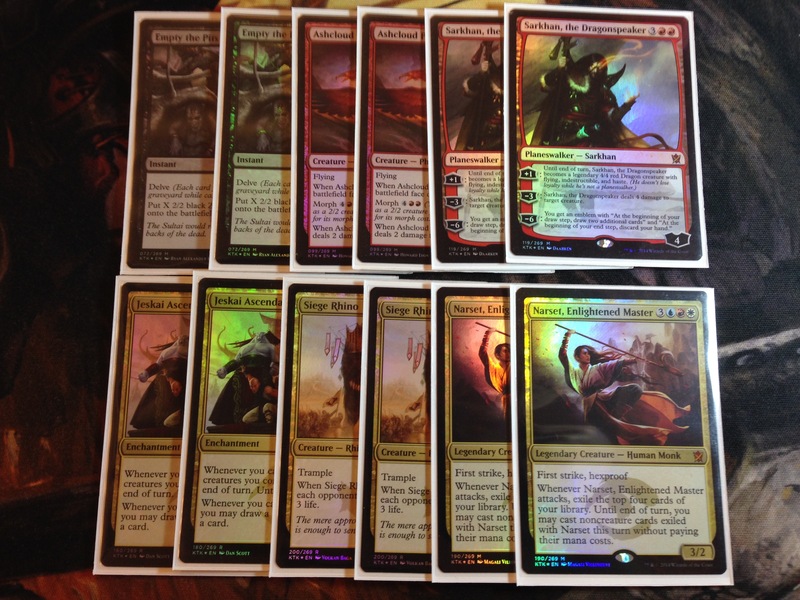 The total buylist price is the total price of the best buylist price for each foil in the set. The price of the set on Magic Online was calculated using Goatbot‘s prices where available, with any missing prices (Goatbots does not show the price of a card if the card is out of stock) filled in using MTGOWikiprice. If possible I prefer to assemble a complete set from a single bot or bot chain as the smallest denomination for Magic Online event tickets is 1 ticket ($1) and the remainder from any trades or purchases with bots that is smaller than 1 ticket will be kept on that bot or bot chain as bot credit. For example, if you buy a card priced at 22.42 tickets, you would be giving the bot 23 tickets and the bot would register the remaining difference of 0.58 tickets as bot credit, which would go towards future transactions with that bot or other bots in its chain. If you assemble your complete set using multiple bots, you could end up using more event tickets. This price of the set on Magic Online column does not include the handling fee of $25 and shipping fee which is $2.99 if you are redeeming to an address within the United States and $29.99 if you are redeeming to an address outside the United States. Is It Worth Redeeming for a Quick Flip? Let’s assume we are redeeming sets off Magic Online and then buylisting every single card in the set, which is actually better off than selling the factory-sealed box on eBay. Recent completed sales for Fate Reforged and Khans of Tarkir foil sets sold for lower than the buylist total. 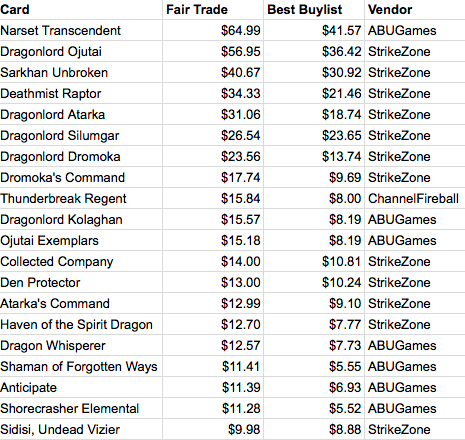 I’ve compiled the vendor with the best buylist price for the expensive foils in the set and it appears that you would only need to buylist to two to three different vendors and at most four vendors to get the best buylist price for your foils. So at most I’d imagine the cost of packing and posting the foils to vendors to cost no more than $20. Redeemed cards come in a factory-sealed box and are usually in near-mint condition (or Marcel-mint), so grading should not be an issue. In theory at least. Of the three redemptions I’ve done, all the cards were in perfect condition, save for Ugin, whose left border was slightly worn, probably due to shipping. The rest of the cards in that box was surprisingly in pristine condition. Profit = Total buylist price – Price of set on Magic Online + Handling + $2.99. Profit = Total buylist price – Price of set on Magic Online + Handling + $29.99. Currently, it looks like the only foil set that will be profitable to redeem and flip is Dragons of Tarkir. Even so, most of the buylists are only buying a few copies of the higher end foils, so at most a redeem and flip could only be repeated a few times, unless you have an outlet to liquidate the cards at retail value, say if you own a shop. What about keeping the foils in the set that are of interest to you and buylisting the rest to subsidize the cost of obtaining those cards that you keep? Let’s have a look at the individual sets to ascertain the value of doing so. When my article about redeeming foils went up in January, a complete foil set of Khans of Tarkir could be assembled for $431. The price of putting together a foil Khans of Tarkir set has increased to $461 since then. The supply of Khans foils, especially the mythics dropped drastically after the switch to Dragons-Dragons-Fate draft on Magic Online. While researching this article, Goatbots ran out of the ten most expensive Khans mythic and I have to pull their prices from various other bots, though I rounded the figure up to get a closer approximation to that you have to pay shall you decide to assemble a full foil set of Khans right after reading this article. When I was assembling my foil Khans sets last December and this January, there were only a couple of mythics that cost more than 30 tickets. Today, there are nine mythics that cost more than 30 tickets, and two of them cost 40 and above. Besides the rise in cost to acquire foil Khans mythics on Magic Online, the buylist price for marquee cards that used to used to make up a good portion of the set’s total buylist price dropped significantly, notably the Planeswalkers. When my previous article advocating redeeming a foil set of Khans and selling the other money cards to subsidize the cost of the foil fetchlands went up in mid-January, Treasure Cruise was still legal in both Modern and Legacy, and besides contributing to the total buylist price its presence also propped up the buylist price for Monastery Swiftspear. Assuming that you redeem a foil Khans set solely for the fetchlands and buylist the rest ($139.99), taking into account postage to the vendors ($20) you would be getting your foil fetches for $366.01. The total fair trade price for the fetches is only $317.15. It looks like the window to get foil fetches on the cheap via redemption has closed. I am pretty new to redemption, having started only last December. This is the first time I am observing the price pattern of foil sets on Magic Online and one thing I’ve learned is that the best time to piece together your foil set online is when the set is both being drafted and paid out as prize. Although a set could be redeemed up to two years after the set rotates out of Standard, the window to get reasonably-priced foil sets is small, mainly due to the scarcity of foil mythics after the set stops being drafted and handed out as prize. This does not seem to apply to non-foil sets as non-foil Khans sets are still aplenty on Goatbots. While the price of a foil set of Fate Reforged on Magic Online has not changed much compared to its figures in mid-March when Fate Reforged first became redeemable (I recall paying just slightly more than 210 tickets for my foil set), the total buylist price for the foil set tanked. On 21 March, I posted in the ProTrader forums about getting a foil Ugin, the Spirit Dragon without having to pay his exorbitant foil price tag by redeeming foil Fate Reforged and selling off everything else. 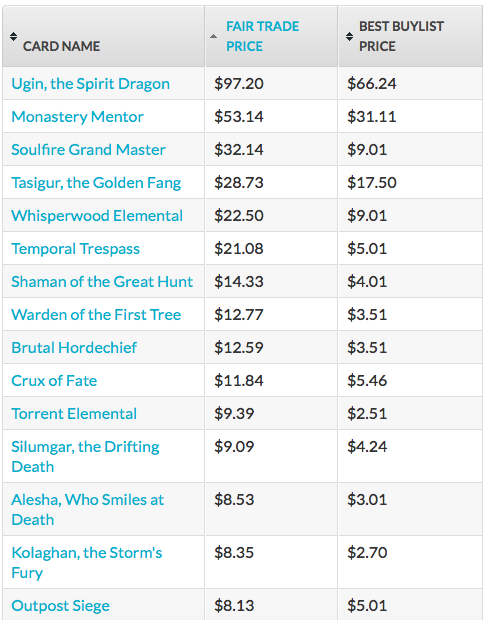 At that time, the total buylist price for a foil set of Fate Reforged was $301.17, and by redeeming and buylisting everything else except for Ugin, you could get your foil Ugin at a cost of $0.91, not including the postage cost for buylisting to vendors. Unfortunately, the total buylist price for a foil set of Fate Reforged has dropped to a paltry $224.35 today. Nearly all foil Fate Reforged mythics and rares except for Ugin, the Spirit Dragon, Monastery Mentor and Tasigur, the Golden Fang tanked in April, probably due to the influx in supply from redemption. Those three cards retained their foil price on the back of eternal and casual demand. Is it still worth it redeeming a foil Fate Reforged set to get your hands on a foil Ugin whose is stubbornly retaining a price close to $100 three and a half months after Fate Reforged‘s release? Redeeming a foil set of Fate Reforged will cost you $235, not including delivery. Buylisting the set without Ugin would rake you $158.11. Crossing off $20 for postage to vendors, you would be securing your foil Ugin at $96.89, which is the same as a foil Ugin’s fair trade price. If you live in the United States, add an extra $2.99 to the figure for redemption delivery. If you live outside the United States, pop on an extra $29.99 instead. You would be better off buying a foil Ugin regardless of where you reside. However, if you are keeping the foil Ugin, Monastery Mentor and Tasigur, the figures look slightly better. The rest of the cards would buylist for $109.50 and taking into account the $20 for postage to vendors, you would be getting your foil Ugin, Mentor and Tasigur for $145.50, which is $33.32 cheaper than the total fair trade price for those three foils. Note that this figure is only worth it if you are living in the United States as the $29.99 redemption delivery would wipe out nearly all of the $33.32 in saved cost. To be fair, it’s quite a bit of effort too just to get those three foils at $33 cheaper than fair trade price (the extra delivery cost from buying those three cards from a vendor negates the extra $2.99 for redemption delivery within the United States). To be honest, the trouble of going through redemption and buylisting just to save $33 on the trio of eternal playable Fate Reforged foils is probably not worth the effort for most people. I personally don’t recommend doing so. As for myself I kept all of my Fate Reforged foil set I redeemed the set to get my hands on foil EDH goodies, and if I were to sell or buylist off the remaining non-eternal, non-EDH playables, the sum I get is not worth the trouble. I prefer to keep them as my collection. After all, even unassuming uncommons like Temur Sabertooth could one day be broken in EDH. By the virtue of being a new set, the redemption math for Dragons is different from its predecessors. As shown in the earlier segment of this article, it is profitable to redeem and buylist all of the cards in the set, even after taking into consideration the $20 postage fee to vendors. Just to reiterate, I would not recommend doing so as the high value foil mythics are wanted by the vendors only in small quantities. As Dragons of Tarkir a new set, the buylist price for foil Dragons of Tarkir mythics are still in the higher stages of its price cycle and foils of rares that recently spiked like Collected Company and Den Protector are still commanding a good price. The profitable redemption process is a good opportunity to get foil EDH and casual golds on the cheap. While Dragons of Tarkir does not have that many eternal playables as Fate Reforged and Khans of Tarkir have to offer, Dragons is a set chock-full of EDH and casual goods. I would say Standard as well, but I tend to shy away from Standard foils. If you are looking to redeem a foil set of Dragons just for the Dragonlords, you would be getting your foil Dragonlords for a total of $34.89 if you are living in the United States, and $61.89 if you are residing outside, both of which are significantly cheaper than the $171.42 total fair trade price for foils of all five Dragonlords. Both figures are inclusive of the estimated $20 in postage cost to send the other buylist cards to vendors. The figures are $107.38 for United States residents and $134.38 for non-United States residents if you keep both Planeswalkers as well, though I would advice against so. 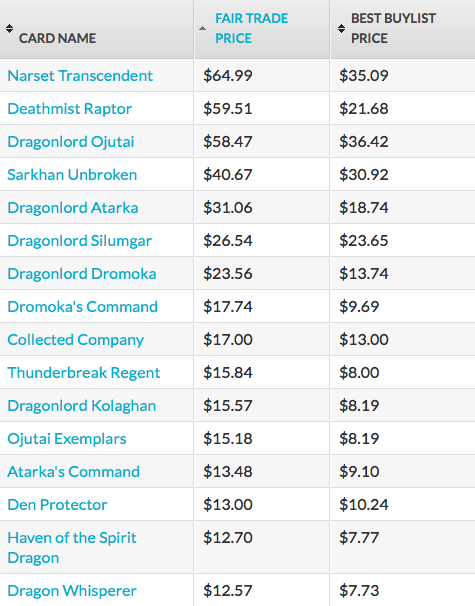 Sarkhan, the Dragonspeaker and Sorin, Solemn Visitor are currently buylisting for under $10, and while I don’t think Narset Transcendent and Sarkhan Unbroken would be tanking to such lows due to Dragons destined to be opened way less than Khans, they certainly would not sustain their current buylist price of above $30. On the other hand, the Dragonlords are seeing Standard play and on top of their casual and EDH demand, I am confident their buylist price would not drop much. It may be better to ditch the foil Planeswalkers and retain the foil uncommon eternal playables like Rending Volley, Anticipate and Silumgar’s Scorn together with the Dragonlords. EDH mythics like Clone Legion and the cycle of rare dragons may also be worth keeping. Do note that if you plan on redeeming foil sets of Dragons, it may be prudent to do it soon, before buylist prices for foil Dragons starts to drop. On Goatbots, it seems that foil sets of the latest set is cheapest a week or two after redemption becomes available and it seems to remain so for a couple of weeks as the new set is still being drafted. I acquired my Fate Reforged foil set for around 220 tickets but it is going for 200 tickets today. I’ve compiled the figures in the table above on Wednesday, and today (Friday) Goatbots is selling a foil Dragons set for just 319.99 tickets, compared to the 332 tickets listed in the table. If you are looking to ship of some of the high value foils in the set to subsidize the foils you are interested in, keep in mind that the buylist price starts to tank a few weeks after redemption begins. The buylist price for foil Fate Reforged mythics started to tank from beginning to middle of April. Fate Reforged redemption begun in the middle of March. Foil sets become increasingly expensive to assemble once the set stops being drafted on Magic Online (as in not the primary draft anymore. You can still draft Khans on Magic Online, but the majority will be drafting Dragons), due to the scarcity of foil mythics. 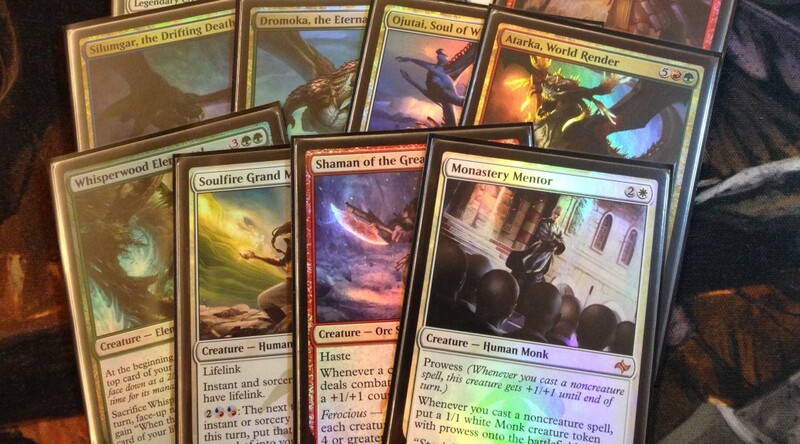 I resented having to fog up 12 tickets for Ugin’s Nexus when I was assembling my foil Khans set. You’d be hard-pressed to find one for under 35 tickets today. I hope that this article answers any questions you have regarding the value of redeeming foil sets on Magic Online. Feel free to share your thoughts or questions below or ping me on Twitter @theguoheng. A lot of very good info here. About a week ago I noticed the price disparity between Foil DTK online and paper and quickly got a set for redemption. Also of note is you can lower your costs a bit buy buying your tix at a lower price $.93-.95. You can also hunt around for a complete set form other vendors, I found one for about 25 tix cheaper than what goatbots were selling theirs for at the time. I’m intent on a quick flip as long as the buylist prices hold. Thanks! Good point, I forgot to mention that you could get tickets from reliable third-party bot chains like Goatbots cheaper than buying from the MTGO store. Do you have the name for the vendor that was offering the set for 25 tix cheaper than Goatbots? I am interested myself as I’ve assembled all four redemptions that I’ve done from Goatbots mainly because they sell them in full sets (I’ve always assumed that Goatbots are cheaper seeing that the majority of their prices are slightly cheaper than the average). But I certainly would not mind going through a bit of inconvenience assembling the pieces individually if I get to save $25! You mentioned sets are redeemable up to two years after they come out. For a future article, can you look into redeeming sets towards the end of that life cycle. That (used to be) right before rotation, but now it’ll include rotation, which is when set values are dropping. Perhaps redemption of sets like Theros are more lucrative for long-term strategies, by buying on the cheap (rotation-affected) pricing, redeeming, and then holding onto the full foil set for a year or so after it’s rotated out. Yup, that is certainly something worth looking into. Though it would probably apply more for non-foil sets as we are still a year away from Khans’ rotation and it’s quite expensive to assemble a foil Khans set right now. Non-foil sets are still cheap and aplenty. Now that you’ve mentioned it, there is an interesting phenomenon that happened a few months back. Goatbots was offering 100 tix for a foil Havengul Lich right before Dark Ascension’s redemption ended. I guess someone really wanted to redeem their foil DKA set. Why are Deathmist Raptor Foils the most expensive DTK card on MTGO? What does that mean for Dragonlord Ojutai Foils that are currently cheaper than Deathmist Raptor Foils on MTGO? Are Paper Dragonlord Ojutai Foils going to tank in price once redemption gets rolling? 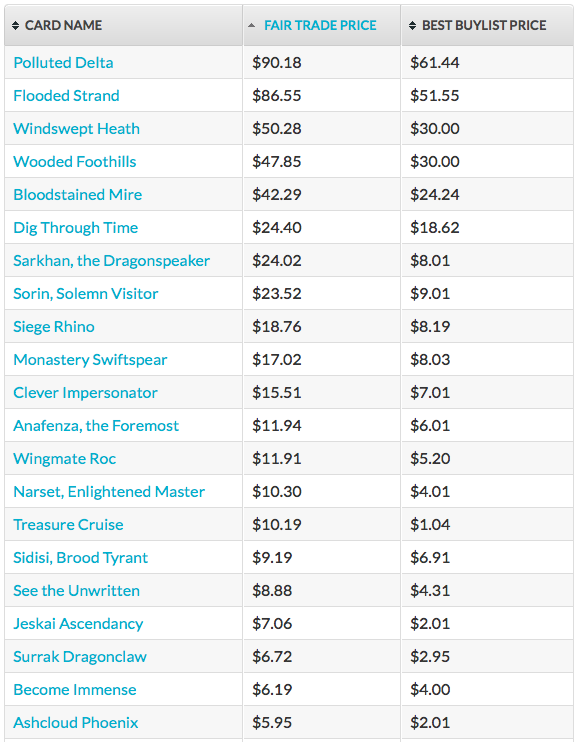 Will Deathmist Raptor Foils maintain their current price in paper because they are priced almost the same on MTGO? What do you think? Deathmist Raptor foils overtook the price of foil Dragonlord Ojutai reflecting the non-foil trend. Hard to say for if Dragonlord Ojutai foils will tank in response to redemption. He is one of the most played mythic in Standard and could potentially be Modern playable (if Jeff Hoogland’s UW brew which he took down an SCG IQ with turns out to be a competitive archetype). My current prediction would be no. Casual and EDH demand could contribute to his foil price staying high amidst redemption as well. While Deathmist Raptor is super prevalent in Standard, it is not seeing play in Modern and is unlikely to have any casual or EDH demand. Foils of cards whose price is propped up solely by Standard demand is unlikely to hold their prices. Came back to this article as I wanted to mention something and ask your opinion – the price of a foil DTK set on Goatbots is down to $269.99. I got in at $300 (firs time redeeming) but the value has done nothing but decrease since I purchased. In your opinion, do you feel you need to change your position on what the best time to redeem is, knowing this information? Or do you feel that DTK is different somehow from the regular trend? To be honest, I am not sure why did DTK foil sets dropped at a steeper rate then KTK and FRF. Perhaps there is less demand for DTK foil redemption? You have a good point there and I’ll certainly need to take a look at the price trend of a few more sets after you’ve pointed this out. I would still advocate getting your foil sets a week or two after redemption hits for the fact that the buylist price for the unplayed high end foils starts to tank a few weeks after redemption starts, making it harder to recover the cost of redemption. For example, Narset foils are buylisting for $9 cheaper than it was as of writing and Sarkhan is $14 cheaper. Unless of course, you are planning on keeping the whole set and not buylisting or selling any components off!